Today is Leonard Peacock's birthday. He has big plans for the day that include delivering gifts to four friends, killing his former best friend with his grandfather's WWII pistol, and then shooting himself. Leonard's mother is completely disconnected from her son's life. Working as a designer in New York, she leaves Leonard to fend for himself in New Jersey. She doesn't even remember that today is his birthday. In fact, no one knows that today is his birthday. Leonard spends the first hours of his day delivering gifts to the only four people he considers to be his friends. He first visits his neighbor, Walt, who is intensely obsessed with Humphrey Bogart films. He then visits Lauren, a Christian homeschooler who has worked very hard to convert him to Christianity. At school he delivers gifts to Baback, a violinist whose practice sessions he has listened to for years, and Herr Silverman, his favorite teacher who teaches his Holocaust class. As Leonard meets with each of these four friends, he reveals not only his past experiences with them, but also what brought him to this day. Matthew Quick tackles a very difficult subject in this novel. In a time where school shootings are prevalent, I very much appreciate a book written from the shooter's perspective. So often, and rightly so, we focus on the people that are victims of these shootings. I do feel that we often forget to consider the young teenagers who feel that they are left with no other option than to kill their classmates and then end their own lives. What brings them to this point? Did they ever reach out to parents, friends, or teachers? Was help offered? 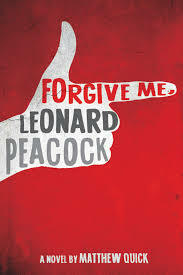 In this novel, Matthew Quick creates a story that gives his readers an opportunity to see where Leonard has come from and why he has been brought to such a dark place. Note: I received an advanced copy of this book to write this review. It is set to release on August 13, 2013.